Here's another chance for you to win your way to the Malta Poker Festival! Intertops Poker and Juicy Stakes Casino are doing another round of €500K Malta Poker Festival satellite tournaments starting September 19th and continuing until the Final September 30th. Here's another chance for you to win your way to the Malta Poker Festival! 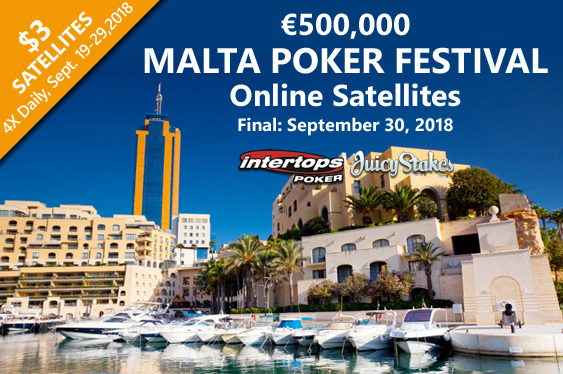 Intertops Poker and Juicy Stakes Casino are doing another round of €500K Malta Poker Festival satellite tournaments starting September 19th and continuing until the Final September 30th. Contenders for the Maltese throne can win their way to the satellites Final in $3 Step 1 qualifiers held four times daily. Tim O’Keefe won the first round of Malta satellite tournaments in August. Malta has 7000 years of fascinating history and a diverse culture. The food is great and the beaches and secluded swimming holes are bella. Tim has won satellites at Intertops before and played with the Intertops Poker team in Europe and the Caribbean. The Malta Poker Festival is held at the Portomaso Casino, right in the heart of Malta's vibrant night life. Players from around the world will be flocking to the Mediterranean for the monster No Limit Hold'em Grand Event and its guaranteed €500,000 prize pool. The online satellites' $2500 prize package covers the winner’s buy-in to the Malta Poker Festival Main Event, Day 1C. $500 toward travel expenses is included. The online champion will stay at the posh Hilton Hotel November 2 – 7th. The Intertops team will take them to an exclusive MPF VIP party. You can buy-in at the first level for $3 and win your way to the Final, or just buy-in at Step 2 or the Final table. Satellite registration is under the Tournaments tab in the poker room lobby. Intertops Poker and Juicy Stakes Casino dominate the busy Horizon Poker Network and welcome all kinds of players from all over the world. Further information on Malta Poker Festival online satellite tournaments is available at Intertops Poker and Juicy Stakes Casino.